Park City, Utah’s Ted Ligety on Friday joined the 20-win club – some very rarified air for any World Cup ski racer, but especially for an American. Ted Ligety captured the 20th World Cup win of his career Friday with a stunning super combined victory to open the 58th Lauberhorn races in Wengen (Getty Images/AFP – Fabrice Coffrini). 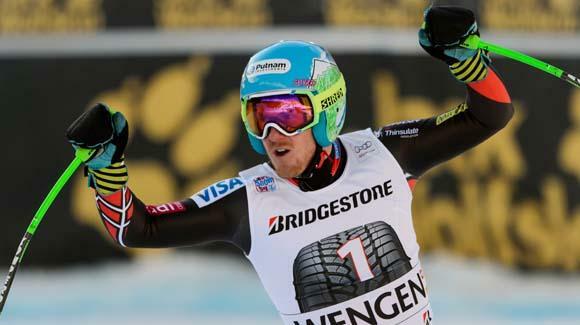 By winning a super-combined (one run of slalom, one run of downhill) on the famous Lauberhorn course in Wengen, Switzerland, Ligety recorded his 20th career win – his first in any event other than giant slalom – and became just the 19th ski racer to win 20 World Cup races. And the 2006 Olympic combined gold medalist is only the fourth American to ever accomplish the feat, behind Lindsey Vonn (59 wins), Bode Miller (33) and Phil Mahre (27). There are five active racers now ahead of the 29-year-old Ligety on the men’s career victory list, and three of them – Austrian Benjamin Raich (36 wins), Miller and Croatia’s Ivica Kostelic (26 wins) – are nearing retirement age. Only Ligety contemporary Aksel Lund Svindal (25 wins) and 24-year-old Austrian superstar Marcel Hirscher (22 wins) threaten to outpace Ligety. The race was run in a reverse format, with the slalom portion being staged before the downhill. Ligety is also the defending world champion in super combined. Ligety, who ran bib one, was second after the slalom, 1.22 seconds behind Alexis Pinturault of France, and finished 13th in the downhill to overtake Pinturault for the win. Americans have won the Olympic gold medal in the combined event at the last two Winter Games, with Ligety the surprise 21-year-old victor at the 2006 Torino Olympics when Miller surrendered a huge lead after the downhill by straddling in the slalom. And then Miller won his only Olympic gold in the event at the 2010 Vancouver Olympics. Miller finished ninth on Friday, and Jared Goldberg (Holladay, UT) was 20th, scoring his ever first World Cup points. Ligety and Miller finished 1-2 in a giant slalom earlier this season at Beaver Creek.